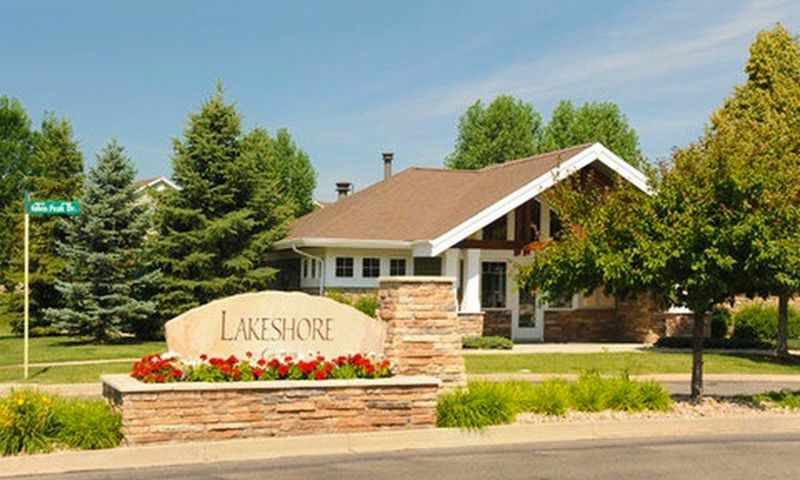 Lakeshore at Centerra is an active lifestyle community located in Loveland, Colorado. This neighborhood is part of the Centerra master-planned community. Residents enjoy a private clubhouse with well-appointed amenities that keep them physically fit and socially engaged. With just 280 residences, homeowners can mingle with their neighbors to build lasting friendships. All condos are maintenance-free, making it easy for residents to leave the hassles of exterior home chores behind and instead have more time to relax or pursue new interests. The clubhouse in Lakeshore at Centerra provides residents with endless opportunities for socialization and relaxation. Indoor amenities include a multi-purpose room where neighbors can get together and bond over similar interests. An exercise room is ideal for maintaining a workout regimen. Outdoors, residents can swim in the pool or soak in the adjacent spa. Homeowners can take leisurely strolls or early morning jogs along the community's walking and biking trails. They can also get some fresh air while appreciating the neighborhood's scenic pond as well as the parks and natural space. Lakeshore at Centerra was developed between 2002 to 2014 by Landmark Homes. This active lifestyle community consists of 280 condos available on a resale-only basis. Homebuyers can choose from three unique floor plans that range in size from 1,070 to 1,120 square feet and have one or two bedrooms, two bathrooms, and a detached one-car garage. Condo units feature maple cabinets, central air-conditioning, designer finishes, elegant master suites, walk-in closets, patios, and storage areas. One of the many benefits of living in Lakeshore at Centerra is the carefree environment. A monthly homeowners' association (HOA) fee includes common area upkeep, access to amenities, trash removal, lawn care, and exterior home maintenance. Residents enjoy a vibrant and friendly atmosphere that allows them to socialize freely. Thanks to the HOA, residents have more time to have fun at the swimming pool, pick up a hobby, or start a new club with other adults in the neighborhood. They can also attend holiday parties, community events, or casual get-togethers in the clubhouse. Whatever they choose to do, homeowners will be pleased with the social options available to them in Lakeshore at Centerra. Ideally situated in Loveland, CO, residents have easy access to everyday necessities. Major roadways like Route 34 and Interstate 25 are nearby for driving around town quickly. A short ten-minute drive gets homeowners to The Promenade Shoppes Centerra where they will find an ice skating rink, movie theater, Macy's, Best Buy, and plenty of other retail shops and restaurants. Outdoor enthusiasts will love having a variety of parks and recreational activities in the area like Boyd Lake State Park and Loveland Sports Park. Golfers will love being just ten minutes away from Highland Meadows Golf Course for their next game. When traveling long distance is required, Northern Colorado Regional Airport is nearby. Residents can head to Denver for big-city attractions which is about an hour's drive away. Lakeshore at Centerra in Larimer County is a charming community that attracts retirees who seek a low-maintenance lifestyle in a beautiful setting. There are plenty of activities available in Lakeshore at Centerra. Here is a sample of some of the clubs, activities and classes offered here. Lakeshore at Centerra was developed between 2002 to 2014 by Landmark Homes. This active lifestyle community consists of 280 condos available on a resale-only basis. Homebuyers can choose from three unique floor plans that range in size from 1,070 to 1,120 square feet and have one or two bedrooms, two bathrooms, and a detached one-car garage. Condo units feature maple cabinets, central air-conditioning, designer finishes, elegant master suites, walk-in closets, patios, and storage areas. Please Note: Floor plans are not available at this time. 55places.com is not affiliated with the developer(s) or homeowners association of Lakeshore at Centerra. The information you submit is distributed to a 55places.com Partner Agent, who is a licensed real estate agent. The information regarding Lakeshore at Centerra has not been verified or approved by the developer or homeowners association. Please verify all information prior to purchasing. 55places.com is not responsible for any errors regarding the information displayed on this website.